To describe a species, one must first begin by defining the criteria which characterises the species, in order to then be able to determine the individuals that are included therein. In the case of sharks, however, this is not an easy task because the morphological and behavioural differences among the numerous members of this family are quite significant. One thing they do have in common is that they are all cartilaginous fish. And yet, to understand the incredible diversity of this family, think about the fact that the spined pygmy shark (Squaliolus laticaudus) measures less than 30 centimetres in length whereas the whale shark (Rhincodon typus) can easily surpass over 10 metres! Their food also greatly varies, depending on the species from the great flesh predator, the great white shark (Carcharodon carcharias) to the docile basking shark (Cetorhinus maximus) that eats only plankton quite a difference, indeed! All of this means that the Shark family numbers over hundreds of different species that live spread out in all the oceans of the globe (with the exception of the Antarctic); there are yet others that live in fresh or brackish water (example, the bull shark, or Carcharhinus leucas). What's more, new species are all the time being determined by scientists! Their skin is coated in bumps which allow them to swim more efficiently (See the report on energy/speed) the shortfin mako (Isurus oxyrinchus) has been credited with a speed of 45 to close to 100 km/h (to be confirmed). Their jaws are incredible tools, those of the great white (Carcharodon carcharias) are very mobile and capable of generating several tonnes of pressure. They also have several rows of teeth. Only the first row is functional, with the others serving as reserves when their primary teeth go missing or are broken. Sharks breath by means of their gills which captures oxygen that has dissolved in water. Without lungs, they must constantly make this water circulate. The technique to do so depends on the species; for example the tawny nurse shark (Nebrius ferrugineus) passes long moments on the ocean floor, is able to inhale water and/or hold himself against the current, whereas other species must swim without stopping, such as the blue shark (Prionace glauca). Hundreds of millions of years of evolution have graced these beings with exceptional organs of detection that assist them in their search for food. Many sharks feed on hurt or dead prey; species such as the tiger shark (Galeocerdo cuvier) are able to sense a single drop of blood in millions of litres of water. They also have the ability to perceive changes in the electric field around them (thanks to organs known as ampullae of Lorenzini ). They are therefore able to detect the presence of living beings even when hidden underneath sand. There are multiple different ways, depending on the species. Some of them, like the bull shark (Carcharhinus leucas) are viviparous (the young develop in the uterus of the mother and are born totally formed), whereas others, such as the small-spotted catshark (Scyliorhinus canicula) are oviparous (the mother lays eggs under water) whereby the young will be protected by a shell in which they finish their development . Yet others are ovoviparous (embryos develop inside eggs which are retained within the mother's body until they are ready to hatch, with no nutritional relationship between the two). This last method is the most common mode of reproduction among the different shark species. First of all, what sharks are we talking about? As we have seen, there are literally hundreds of species. The first name which probably comes to mind is that of the great white shark (Carcharodon carcharias) the star of the film Jaws. According to statistics, however, there are less than one hundred shark attacks each year and less than a dozen deaths. Thus, the image of the unbridled vicious man eater is very far from reality. The terrible paradox of these kings of the sea is that they induce fear in many people but in reality, they are actually the ones in danger.... because of man! 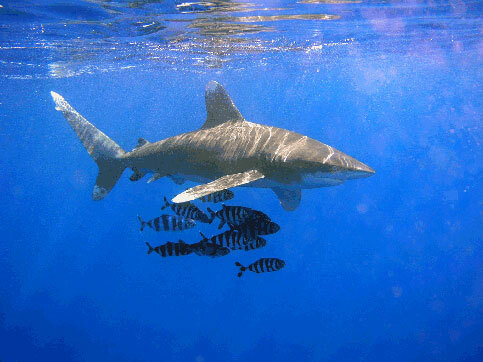 In 2009, experts deemed that one third of sharks in the open seas were threatened with extinction. It is thus imperative to stop this massacre immediately.